The weather during my travels was hot and muggy with temperatures hovering in the upper 80s! There was hardly a cloud in the sky the whole trip. It was a welcome but also difficult change from the cold, wintry weather in Ulaanbaatar. The temperature was -10 degrees F when I left the Mongolian capital! Even in shorts and a T-shirt, my body needed a lot more fluids and calories to help regulate its internal temperature and I never stopped sweating which was probably good. Imagine going from the dead of winter to the hottest day in summer in less than 24 hours! 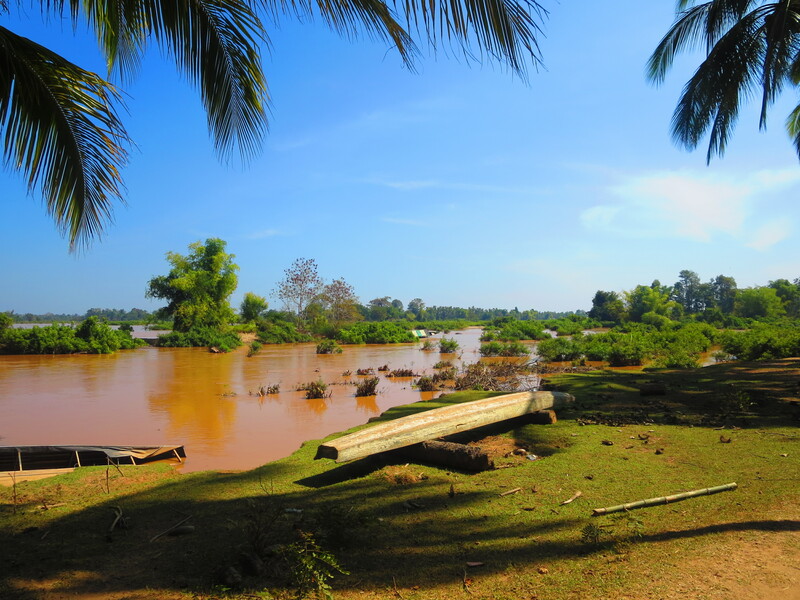 The Mekong River as seen from the banks of Don Det, a small island in Si Phan Don, the 4,000 islands region in Southern Laos. What was a memory that stands out from your trip? I went on a kayaking trip with my friends while staying on the island of Don Det. Our guide brought us through narrow side channels, forcing us to weave between small islands and duck beneath overhanging trees and brush. After several hours, we reached the middle of the massive muddy river. There were roughly two football fields’ worth of space between us and the shore on either side. 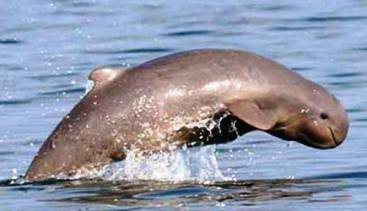 At first I was confused about why he told our group to stop paddling and stay quiet, but soon we spotted several Irrawaddy River Dolphins, a critically endangered species of freshwater dolphin! The lumpy, grey creatures came within fifty feet of our boats and breached the surface with their whole bodies, enabling us to get a pretty good look at them. The local guide told us that there were only six left in this entire stretch of river due to a variety of irresponsible fishing methods. Local fishermen still use arsenic, dynamite, and nets in which dolphins get caught to bring in their catch! What other animals did you see? 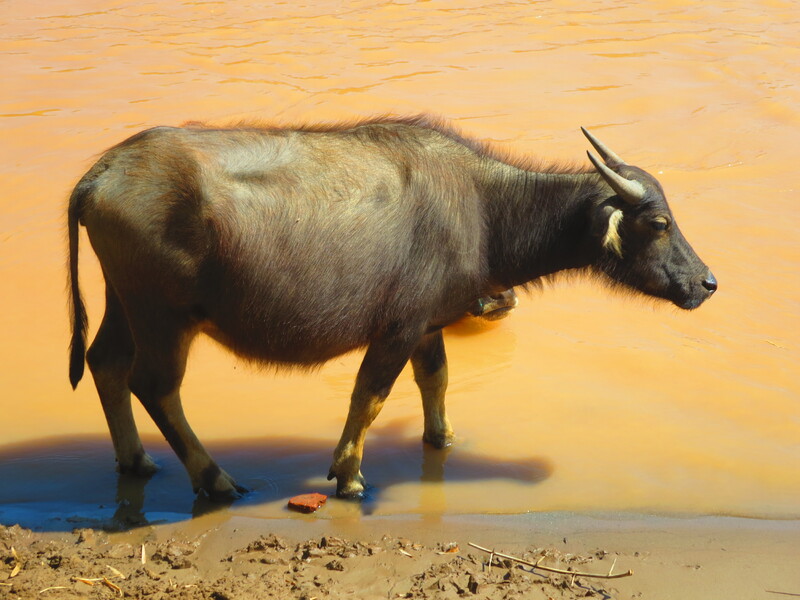 On my tour of the Laotian countryside the most common creatures I encountered were domesticated farm animals, but certainly not the kind we find in the US. 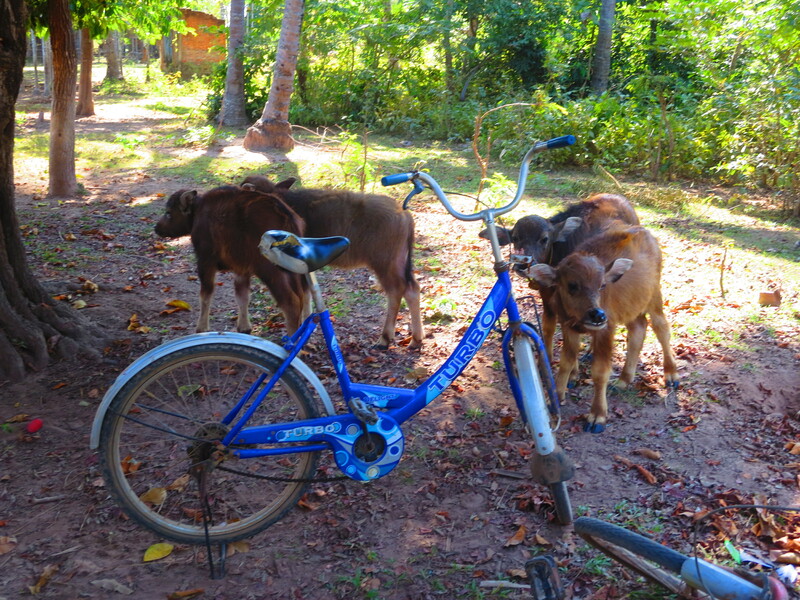 On the small island where we stayed for several days I sighted water buffaloes, ducks, and chickens along the small dusty path that served as a main road. 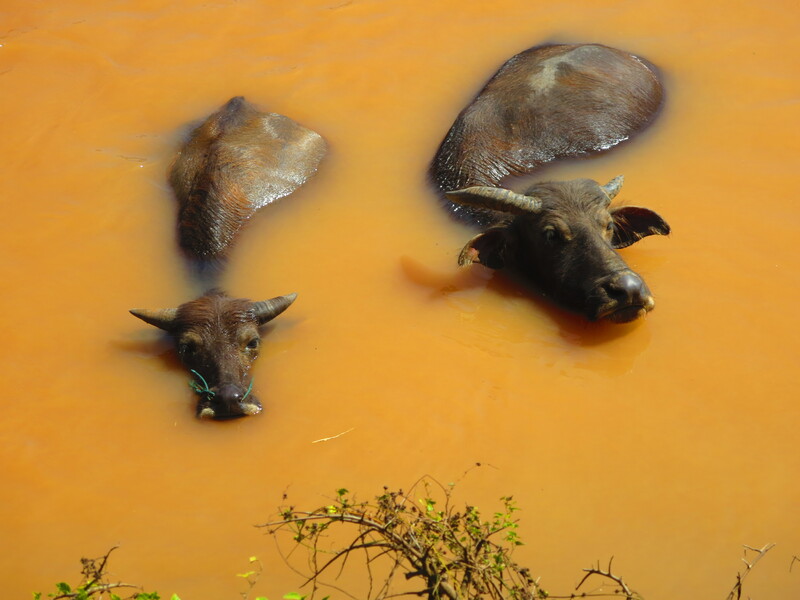 The water buffaloes were escaping the heat of the day by basking in the cool silted waters of the Mekong. One of them was submerged entirely except for this head, making him look almost like a hippo with horns due to his huge flared nostrils and wide cranium. 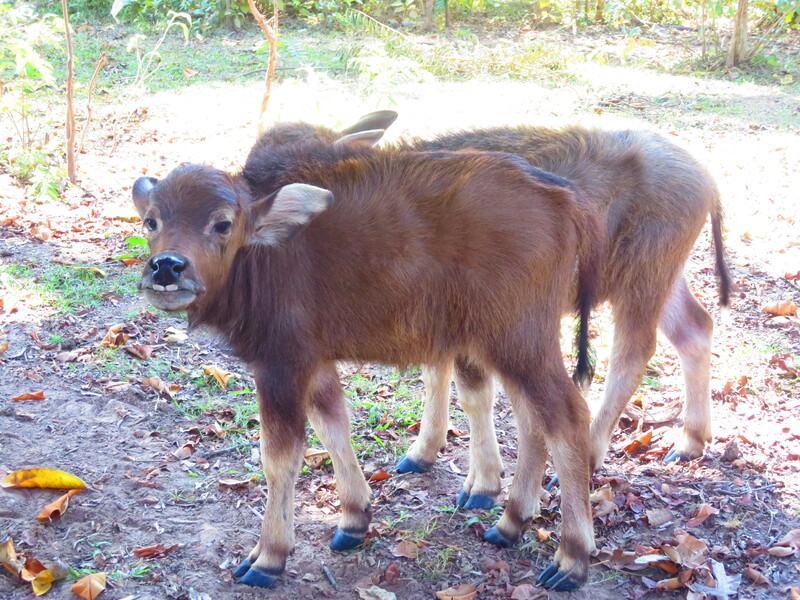 Baby water buffaloes next to a parked bike. A view from the main road on Don Det. The adults were across the road, cooling off in the river. 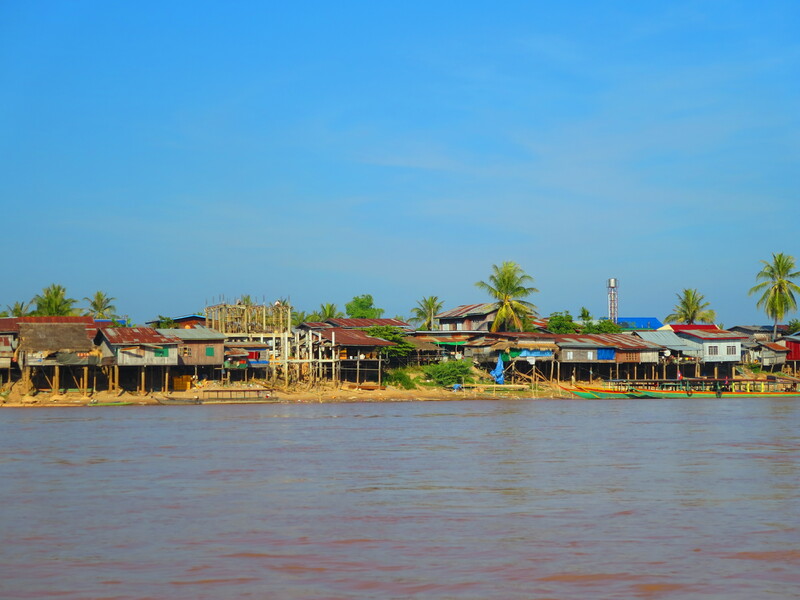 What else did you see on the Mekong River? While kayaking I glanced up at the trees towering twenty feet above us that were growing out of the river. Their tops were bent over as if they had been thrashed in a violent storm. 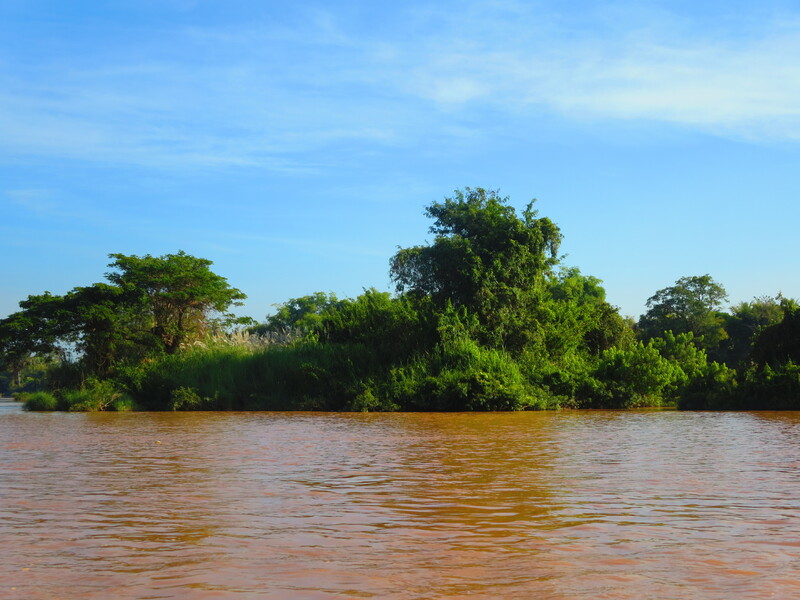 Our Laotian guide, noticing me observing said “the water during the rainy season reaches the tops of those trees.” The water level of the river changes markedly depending on the season. During the summer months, from April or May to October or November, there are monsoons that cause major flooding, which many farmers depend on to irrigate their rice paddies which must have several inches of water to grow. Families build their houses on stilts five to ten feet high (some even higher) to prevent their homes from being flooded this time of year. Thankfully I was visiting during the dry season when temperatures soar but travel is easier because flooding of roads isn’t an issue. Houses on stilts line the water. In some areas the water level can increase by 2-4 meters along the shore. What currency do they use in Laos? The Lao kip is the official and most common currency in circulation. One dollar equals roughly 8,000 kip. Thai baht and US dollars are also accepted in many restaurants and stores. The currency was introduced in 1979 by the government of the PDR to replace the obsolete and devalued previous currency called the Pathet Lao kip. Upon introduction 1 Lao kip was equal to 100 Pathet Lao kip. One bottle of water costs roughly 4000 kip at most markets. 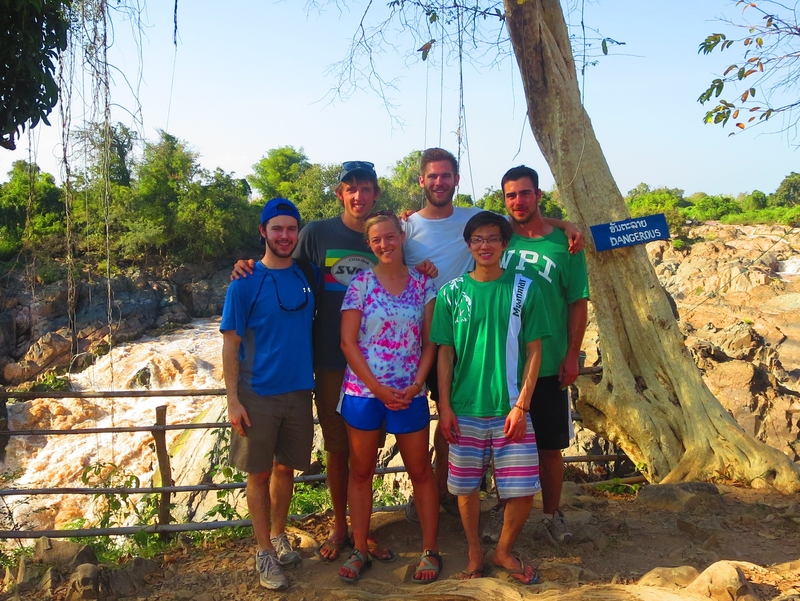 However, renting a bike for a day cost only 8,000 kip and one night in our guest bungalow on the river, complete with hammock and mosquito netting, cost only 10,000 kip per night! What language do they speak in Laos? 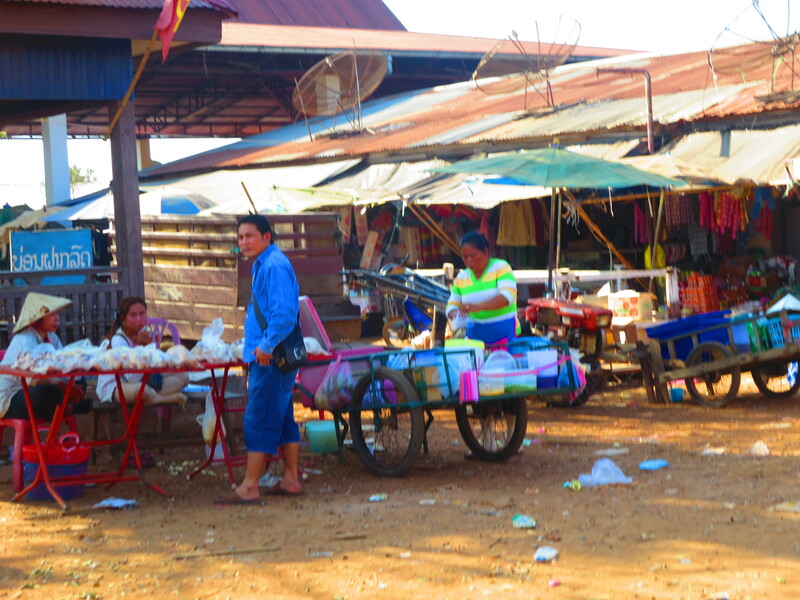 Lao or Laotian is the most commonly spoken language in the Lao People’s Democratic Republic. It’s tonal which means that speakers raise and lower their voices in a much wider range than English. It sounds almost musical to my untrained ears. The locals’ warm demeanor makes it sound like they’re singing to each other in the dusty hot streets. 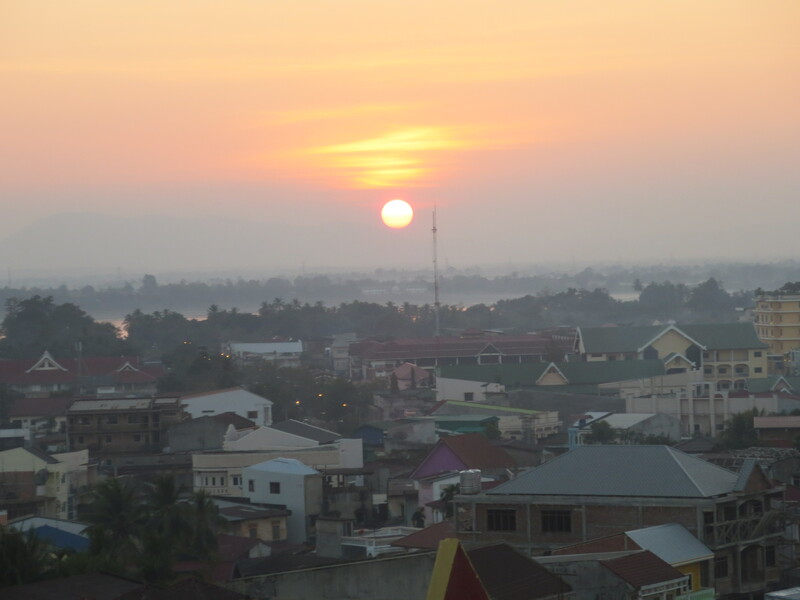 Lao is spoken not only in Laos but also in nearby Thailand and Cambodia. 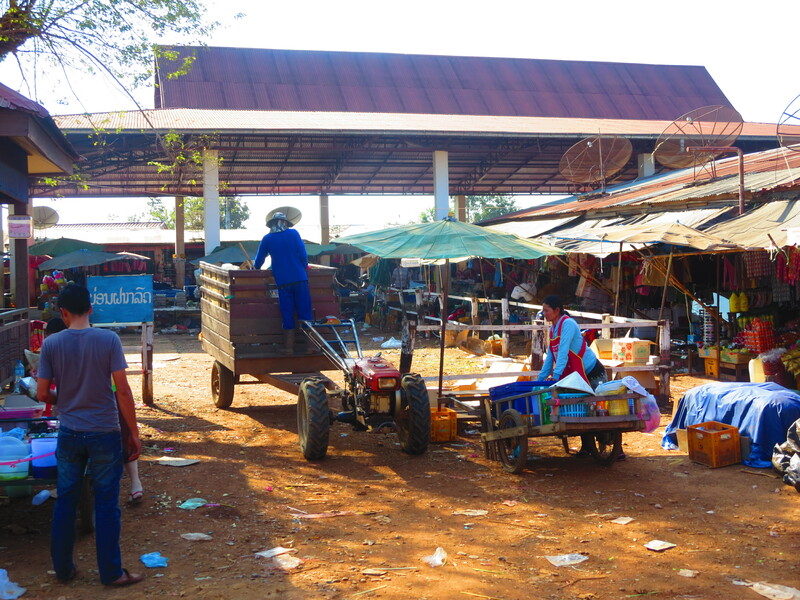 In fact, out of the roughly twenty-five million speakers of Laotian only three million reside in Laos. 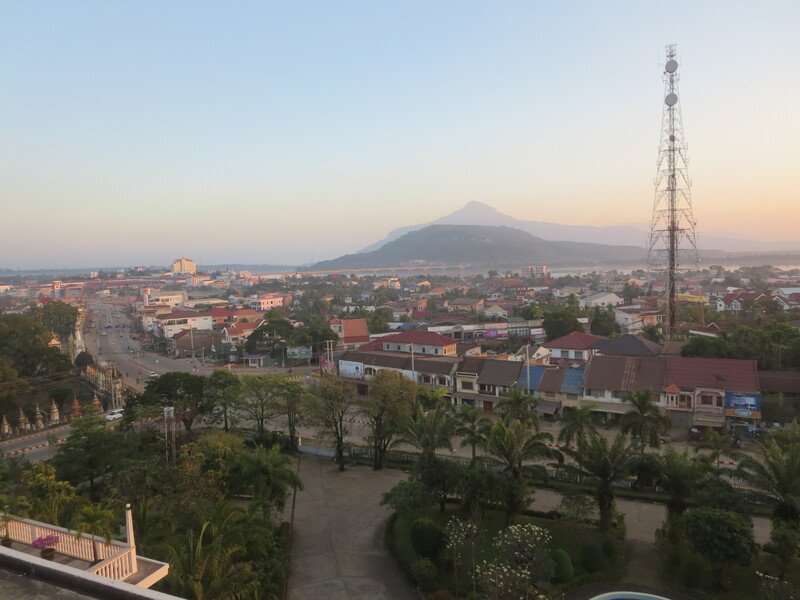 Further, while Lao is the default language, it is common in the hospitality industry, for example hotels, restaurants, etc., for locals to know enough English to communicate with customers. Still, the average English level is very low in Laos. What was your best meal in Laos? Perhaps sadly, the best meal of the week for me was a meatball, sausage, and vegetable pizza! It’s easy to find pizza in Ulaanbaatar but it’s hard to find a great pizza place. My friend Jeremy, who had been living in Japan, hadn’t eaten pizza in 8 months! Upon his request we ventured to a local restaurant in Pakse, Laos that advertised New York style pizza. It even had a picture of the statue of liberty on its sign! While there was nothing deep-dish about it, it was delicious. Between the five of us we finished 4 large pizzas! As far as local food, earlier that day we had some succulent marinated grilled fish balls and green tea flavored iced tea on a street overlooking the river. Vietnamese pho, beef noodle soup, and ban mi, baguette sandwiches, were also major culinary highlights. What was your favorite thing to do on the trip? My favorite activity besides kayaking was renting motorbikes. My friend, Jake, was the only one who had ridden one before so we nominated him as our guide. Following his lead, we zipped around on our glorified scooters, quickly leaving the small urban area to explore the dry rice paddies and wats, or Buddhist temples, in the adjacent rural area. 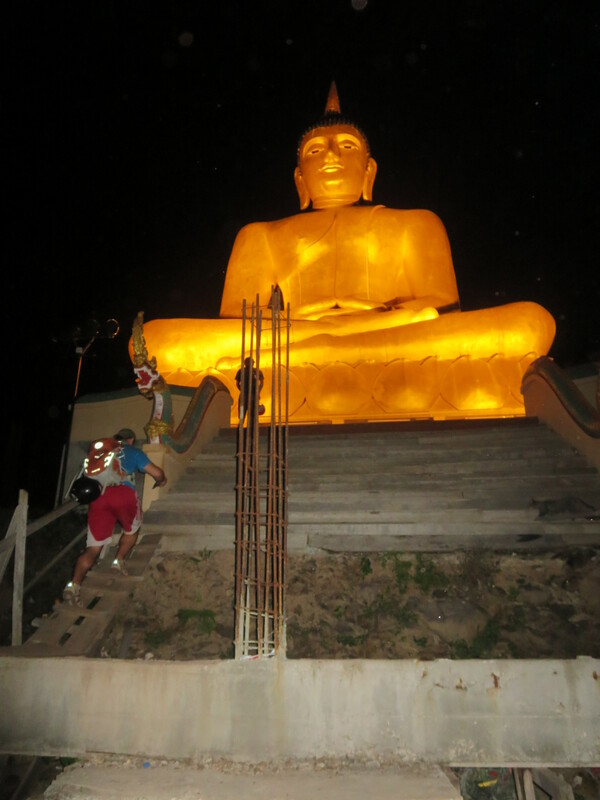 We were welcomed by shaved-headed monks adorned in orange and yellow robes. 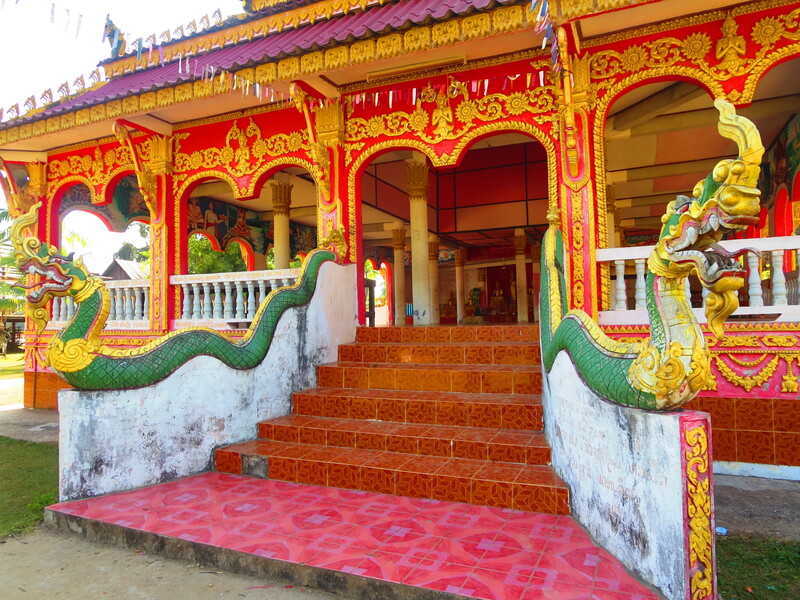 Following the local custom, we took our shoes off and examined the elaborate murals and Buddha and dragon statues inside the open-air prayer rooms. Another highlight of our motorbike adventure was finding a deserted spot on the river to skip rocks and watch the fishermen motor by. One of the countless wats we passed! 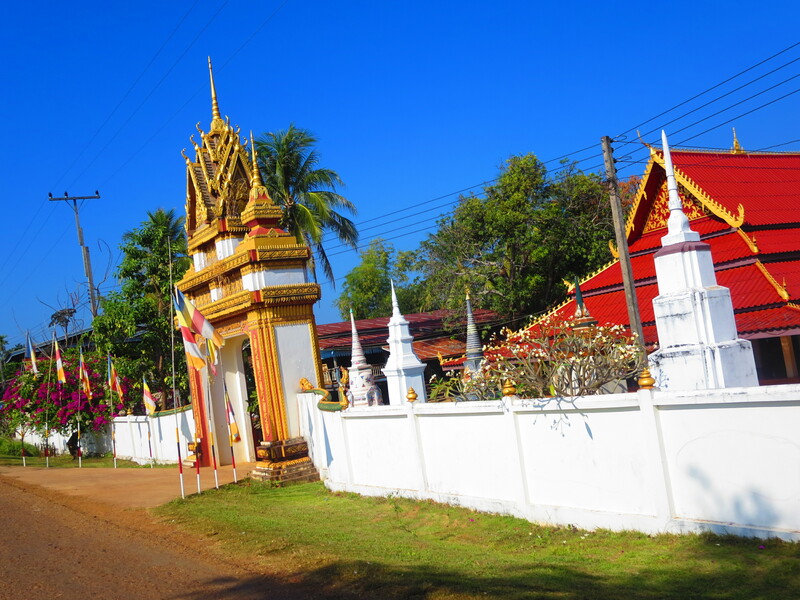 The entrance to a Laotian temple. As you can see, virtually all temples are open air, with no walls necessary. Some also had rows of fans on the ceilings to ventilate. 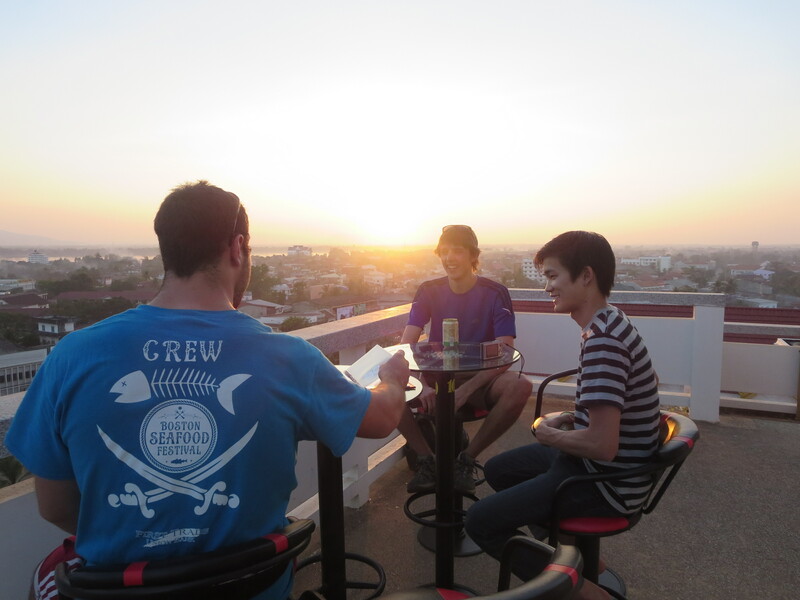 After a long afternoon of motorbiking, we watched the sunset from the rooftop bar of a local hotel. 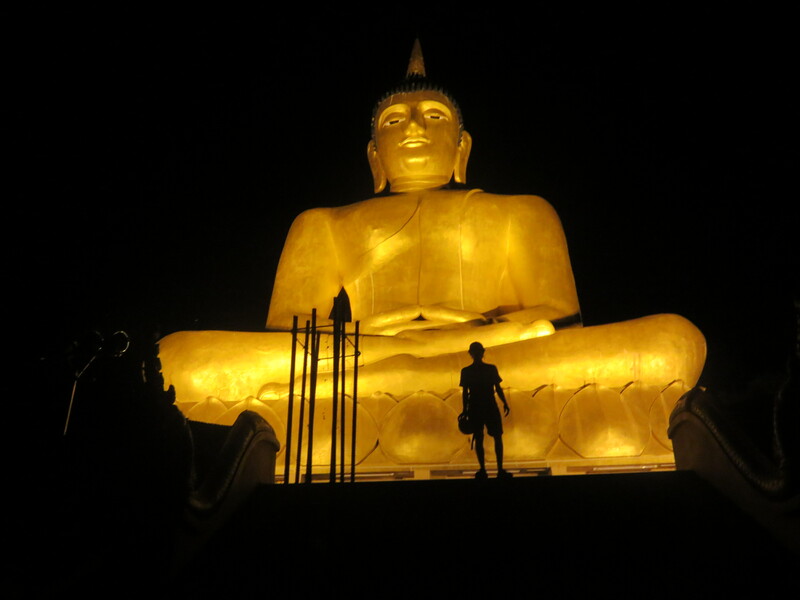 During our motorbike adventures, just before sunset, we spotted a massive golden Buddha statue perched on a hilltop overlooking the town. 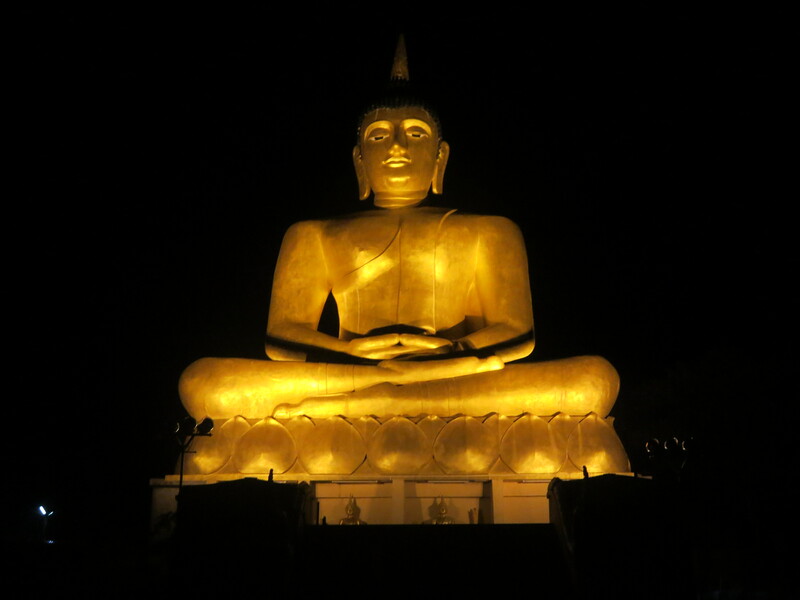 Although it was nighttime by the time we reached the trail head leading to the effigy, the moon was bright and guided us while we bush whacked through the jungle in search of the shoddy unlit boardwalk. The view from the summit was totally worth it! 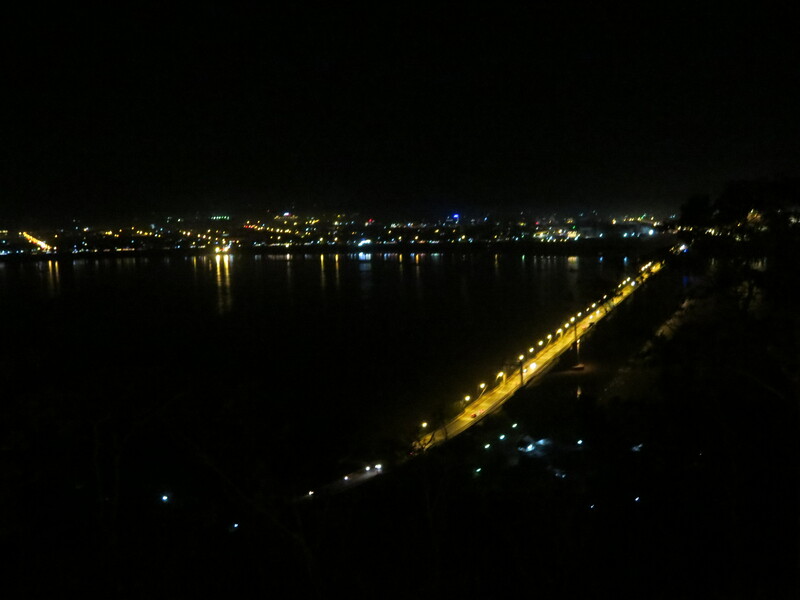 We motored across the busy bridge, tested out several wrong paths in the dense forest at night, braved a crumbling boardwalk by moonlight, but finally we made it to the top! What was your favorite game you played? My favorite game of the trip was juggling a woven soccer ball made of stiff wicker-like reeds that my friend bought at a local market. This is one of the most popular pastimes among Laotian children, who set up volleyball nets in the dry rice fields and kick the softball-sized ball back and forth over the net. What was your most interesting method of travel? 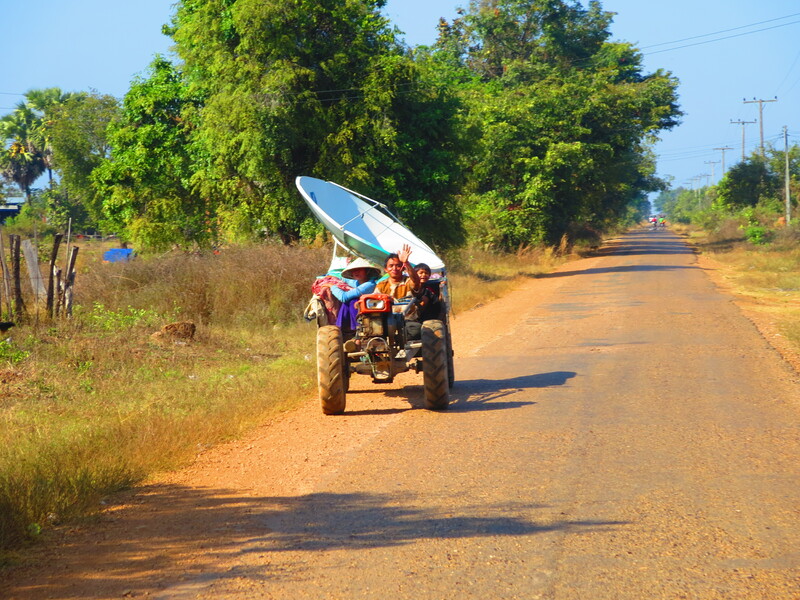 On our trip from the riverside town of Pakse to the small island of Don Det my friends and me experienced a very local means of transportation. The “song-tu” is a large flat-bed truck modified to hold three parallel benches underneath a tin roof loaded down with luggage. Typically, these barrel down the road with people packed in like sardines, hanging their arms and heads out due to the crammed seating. Originally, my friends and I planned to take a normal passenger (Greyhound-style) bus to the ferry landing. However, our taxi driver brought us not to the main bus terminal but to a smaller station with not much time to spare before the last buses left for the ferry landing. 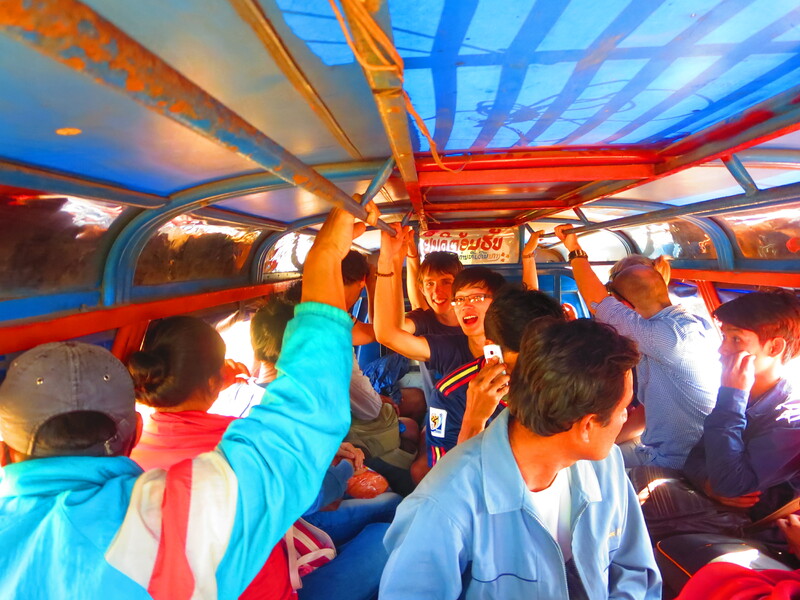 With few good options, we bought our tickets for 40,000 kip and jumped in the back of the “song-tu” for three hours of personal time with the locals. Thankfully I got in last and, from the back of the flatbed, was able to snap some photos of the scenery as we sped along the dry dusty roads. 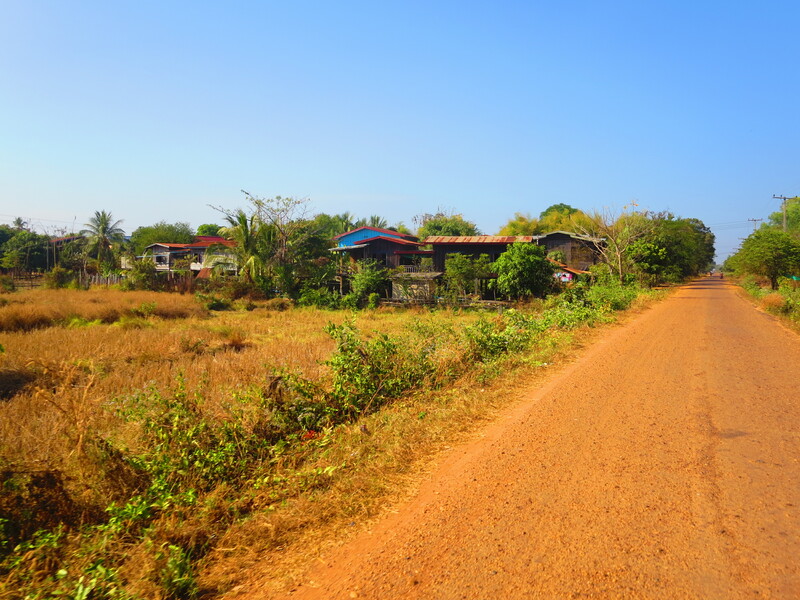 This is what comes to mind when I think of Southern Laos during January. Bone dry rice paddies! 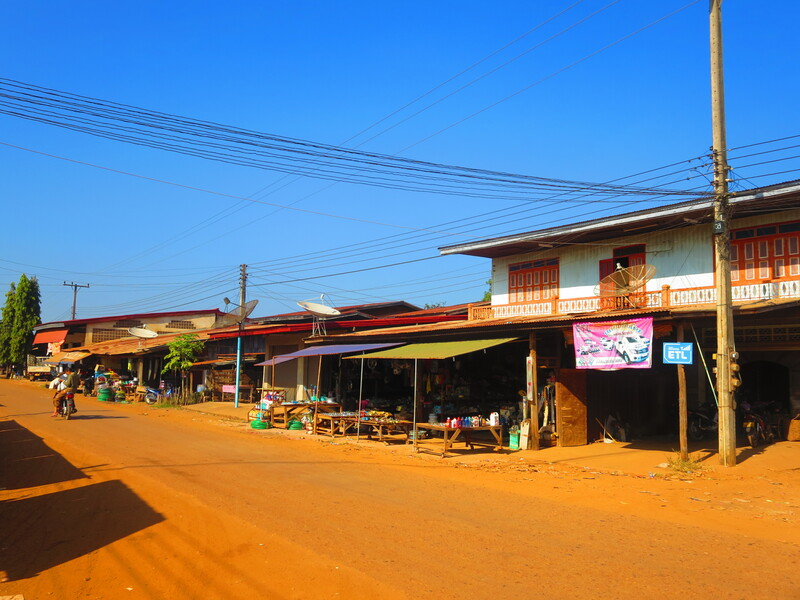 A main street in a small Laotian village. A woman unloads her rice at the local market from her Chinese tractor. Vendors sell snacks for travelers. After arriving at one small village, sticky rice, roasted chickens, and small beef sticks were thrust into the “song-tu” from all sides by local hawkers! I had no choice but to try the coconut rice (it was practically in my mouth already after being shoved into my face). Roasted in a hollow bamboo stalk it was delicious but too messy to even get a photo! 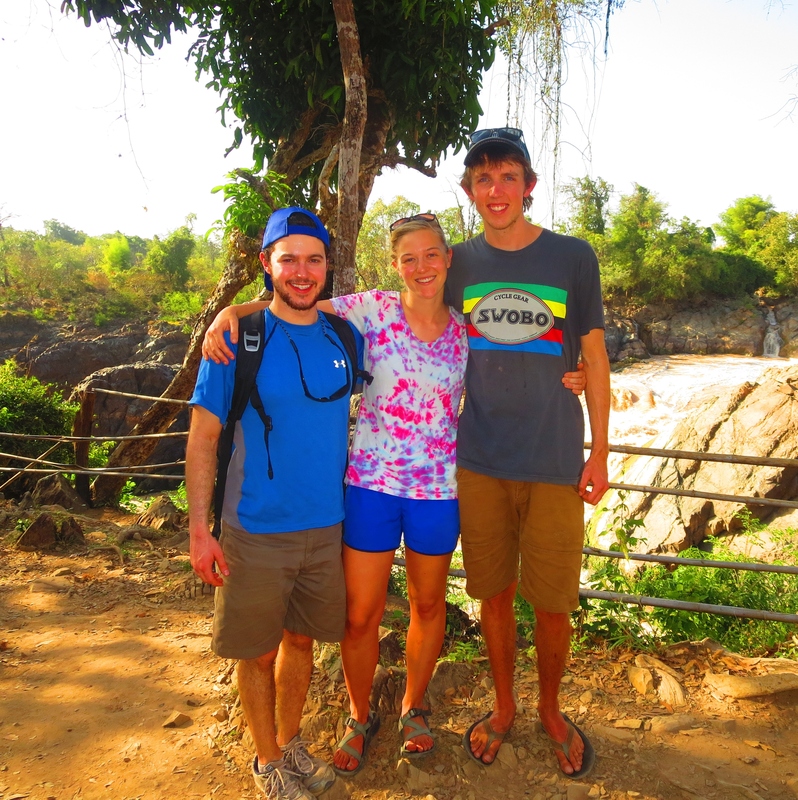 Thanks for reading about my time in Laos! I hope you stay tuned for more updates on Mongolia! Great photos and very informative Peter. I am now informed enough to educate the kids at school! Glad a good (and safe!) time was had by all.